Our Disney Cruise food allergy expert Jennifer, shares her experiences at Disney World on her latest trip. 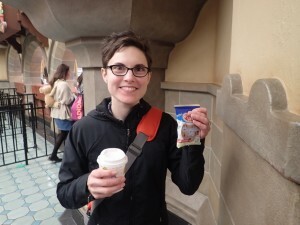 Be sure to check out her Disney Dream review, too. I’ve only heard of the legendary Chef TJ and the works of edible art he creates. 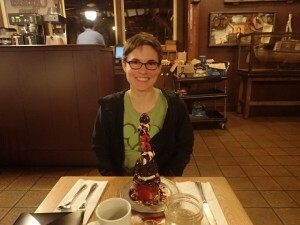 We had a free evening and were able to get some reservations, and were completely blown away. Whilst my husband ate from the buffet, Chef TJ created a six-course meal for me. 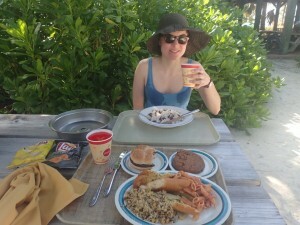 It was more food than I could eat in two days, yet alone one meal! To start: a basic salad with some grilled vegetables and a vinaigrette dressing. 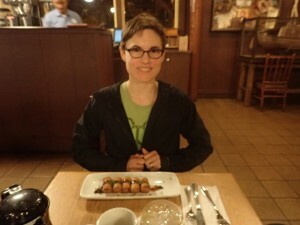 Next up… and I thought this was my main course: vegetarian spring rolls with a sweet and sour type sauce on top. They were delicious! I ate them all. Then Chef TJ came out to say my second appetiser was on its way. Second appetiser??? Two words: Mickey Waffles!! Every single morning (except the day we ate leftovers from Trail’s End). Add some fresh strawberries and pure maple syrup and I couldn’t be happier. 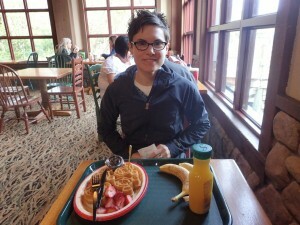 Pretty much the best breakfast you can get at Walt Disney World – or possibly anywhere. (These were Namaste brand mix made with apple juice.) I wish they made Mickey waffle makers to buy and use at home. The first thing we noticed about the Christmas Party, by looking at the map, was that they now advertise that they have EpiPens at the first aid stations – kudos to Disney for that. Next, they said there were free cookies and hot chocolate at select locations. Not exactly exciting for people with allergies, but I asked if they had any alternates and was given options – yes, options! – of apple juice, apple slices (prepackaged), and/or Enjoy Life cookies (prepackaged). I was pretty excited to have choices, all of which I liked. We were able to get the same safe snack options both times we went to the Christmas Party, and from different locations within the park. 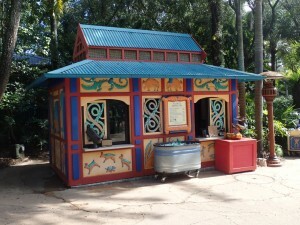 A food cart dedicated to food for people with special diets, wow! I could only have the Enjoy Life cookies and bananas, but just the whole idea that something like this exists is fantastic! 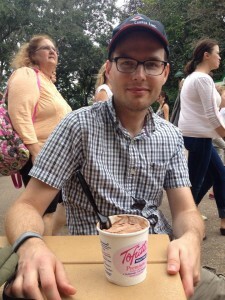 My husband ordered some Tofutti frozen dessert, especting a small scoop in a bowl, and was happily surprised to get a whole TUB of frozen dessert. It was the highlight of his trip, even more than meeting the talking Mickey Mouse. I don’t think he was sad that I couldn’t have any, because he ate the whole tub himself and had a grin on his face for the rest of the day. And we went back another day… and he couldn’t stop smiling the whole day. We dined at many other Disney restaurants during our trip: Rose and Crown, Le Cellier, The Wave (twice), California Grill (during the fireworks), Tony’s Town Square, and more… I just didn’t get pictures at them all. (Kyle was only taking photos of my food whenever I was really excited about something, or not so thrilled on Castaway Cay.) The Wave was one of our favourites, definitely, and we’ll go there for lunch every day we are in the Magic Kingdom next trip, I think. 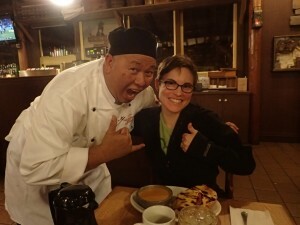 Their autumn curry stew was so good I ordered it twice this trip. 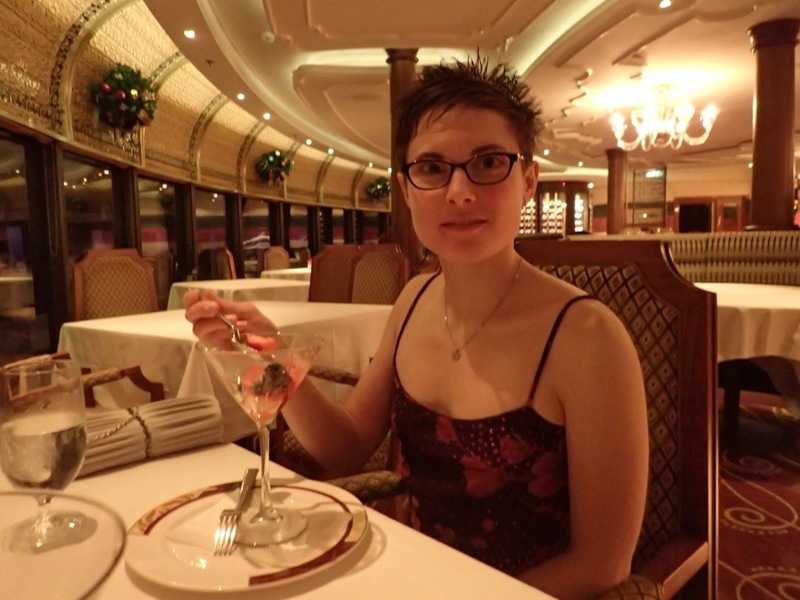 Our Disney Cruise food allergy expert, Jennifer, sent us this great review of her latest cruise on the Disney Dream. Be sure to check out her Disney World reviews, too. On every one of our four Disney cruises, everyone kept telling us that we had to dine a Palo. 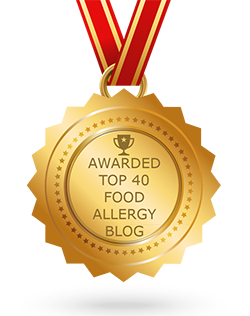 With food allergies, intolerances, and preferences, we weren’t sure if we could eat anything there or if it would be worth it. Well, we were wrong, and everyone else was right. 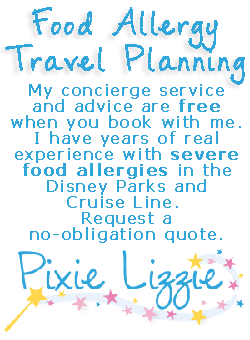 We made reservations at Palo for our most recent cruise, and will do so for every future Disney cruise we take. Per our main dining room server’s recommendation, we went to Palo the evening before our reservation to talk to the restaurant manager, Gonzalo. We were able to sit down with Gonzalo to discuss our restrictions. He reviewed some menu ideas with us and assured us that our meals would be perfectly safe. They would even make dessert! Each step of the way, Gonzalo was checking in, explaining ingredients, and making sure everything was perfect. It was a perfect evening and we are counting down the days until we can check in and make Palo reservations for our next Disney cruise (in June 2015). We had some pretty good food in the main dining rooms on this cruise. However, our schedule didn’t always align with the main dining room hours. 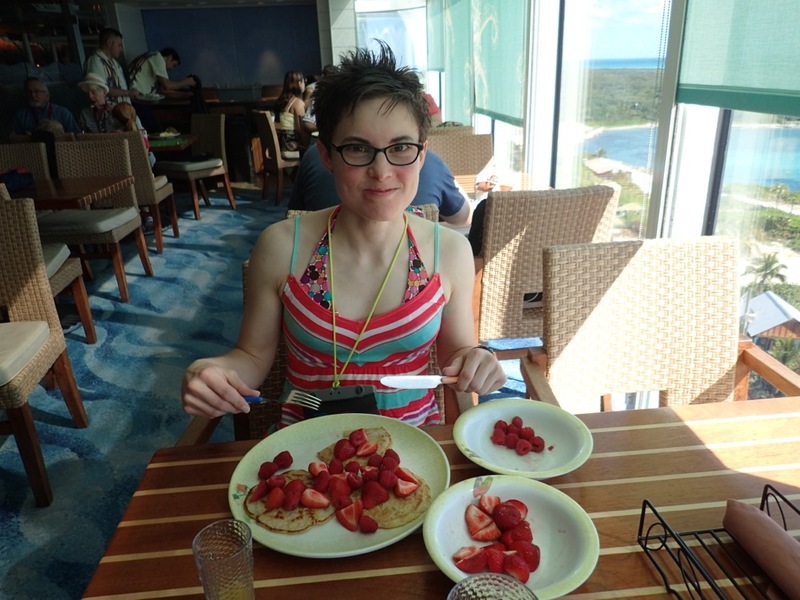 After running the Castaway Cay 5K, you get pretty hungry… so I pre-ordered some pancakes and fruit at Cabanas for after the run. 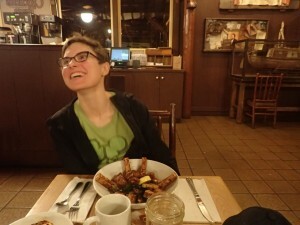 (I actually ordered waffles, but they couldn’t make them for allergies due to cross-contact.) It took about ten minutes for the chef to prepare my order, and then I had more pancakes and fruit than I could eat. Thankfully, my husband was willing to help me out.